* Pocket size, easy to carry out. * Separate electrode, easy operation. 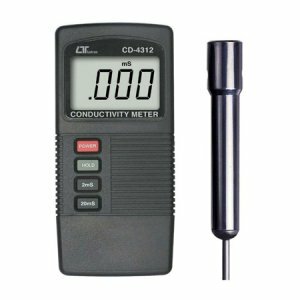 * The portable conductivity meter provides fast, accurate readings, with digital readability and the convenience of a remote probe separately. * Two measuring ranges : 2 mS, 20 mS.
* LCD display for low power consumption & clear read-out even in bright ambient light condition. * Durable, long-lasting components, including a strong, light weight ABS-plastic housing case. * Built-in Low battery indicator. * Wide applications: water conditioning, aquariums, beverage, fish hatcheries, food processing, photography, laboratory, paper industry, plating industry, quality control, school & college.